Time Tip: Write it Down, Put it Up! If you click on the photo you can see each sticky has the cutting amounts for one colour needed for the Halloween quilt I'm making next year. Since I can't resist, I leave these out all the time so when I have the chance I know where I'm at. What I've done. What's left to do. I've started to do this for another current large project. It's helping keep the hundreds of triangles seem less daunting as I cross of 26 and write 37 out of 290! Little steps, remember! Writing it down and posting it makes room in your brain for more important things - like picking your next project!! 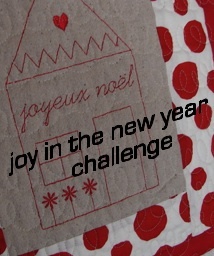 Now, what I really wanted to blog about today was all the fun that is starting up in Quilt Blogging World! The festive season certainly has the quilters and crafters busy planning quick things to make! And finishing things up to start NEW stuff next year! Gudrun's World starts things off on the 9th. Each designer gives tips, techniques, or even a pattern. They have giveaways too! A fun way to check out what some designers are doing for the holidays. I love the NAME of this challenge! And, yes, more prizes! This time you actually have to challenge yourself and declare publicly how many UFOS you want to finish before the new year. If you succeed, you double your entries for the prizes. Check out the details at Tallgrass Prairie Studios. Sew, Mama, Sew has great links for projects and things to purchase for gift giving this season. Comment each day to have a chance to win each day's prize - mostly craft books!